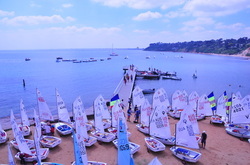 Davey's Bay Yacht Club runs an active sailing program. The Club races on Sundays between October and April, with Juniors sailing Optimists and OziOptis in the mornings and our senior fleet of Flying Fifteens and Lasers racing in the afternoons. We have a fleet of six Pacers which are used for training and racing. We often have Sabres, Fireballs and now 420s on the water as well. The Club runs a heavy program of training, with a strong focus on our youngest members. Kids from as young as eight years of age are on the water from 9.00am most Sundays and we complement this with a program for youth and adult members. In February the Club runs perhaps the largest junior training event in the country, with up to 200 kids participating in the Lidgett Trophy. Since 2000, this inspirational event has made our little club the place to be for one weekend a year.